I meet a lot of women who are reluctant to try women’s clip-in cycling shoes on their bike. They are nervous about falling off their bike if they forget to unclip, or in some cases believe that clip-in shoes are just for super serious cyclists. But I think they are for anyone who plans to do some significant kilometres on their bike. And there are some good reasons why you might want to become more attached to your pedals. Clipping in can stop your foot slipping off when applying power, help align your foot to ensure maximum efficiency, and potentially aid your pedal stroke by allowing you to pull up on the pedal as well as push down. Read more about the different pedal options in my previous post. Whether you ride on the road, explore off road trails or commute to work, the proper cycling shoes can make a big difference in your performance, comfort and enjoyment. There are three types of bike shoes – road, mountain and triathlon, and each are suited to their own particular cycling discipline. Although it does come down to personal preference, and I know quite a few road riders who choose to ride their road bikes with mountain bike shoes and pedals, particularly if they are commuting. Broadly speaking there are two types of pedals – road and mountain bike. Within each category there are a number of brands, with Shimano the market leader in both groups. And shoes can sometimes cross over, but I would recommend if you ride road then use road pedals and shoes, and if you ride mountain use mountain bike pedals and shoes. Cycling shoes should fit firmly so they don’t move around. The idea is to immobilise your foot so you need to feel well supported in the shoes. Your toe shouldn’t be jammed at the end but you also don’t want heaps of room. Within each shoe type there are plenty to choose from with popular brands including Shimano, Specialized, Sidi, Bont and many more. Most of these brands make women’s bike shoes and while some people might tell you that men’s and women’s shoes are just the same, from my experience there are some key differences like the ankle clearance and the size of the heal cup. So make sure you try on a few different shoes before you decide which ones are best for you. Road shoes have stiff, thin soles. 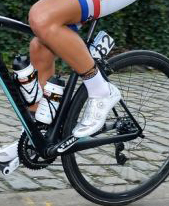 The soles on the betters shoes like the S-Works women’s road shoes I wear, are carbon fibre making them very stiff and light. The stiffer the sole, the less energy you’ll lose between your foot and the pedal. There are different types of closure systems including velcro straps, ratchet closures and boa dials. You have to find what works best for you. More expensive shoes tend to have boa dials. Road shoes need to be well-ventilated so your feet don’t overheat, but you may need to buy yourself some shoe covers for those cold winter rides. The cleats fit externally to the shoes so they are not ideal for walking for any distance. Although you can buy plastic covers (sometimes called café covers) to protect them from damage. Mountain bike shoes have a stiff sole, though not as rigid as road shoes. The sole is also a bit more padded. They usually have recessed cleats and serious treads. Recessed cleats make walking easy so they are ideal for commuters, tourers and others who need to walk any distance with bike shoes on their feet. Triathlon shoes are similar to road shoes. The main difference is that triathlon shoes are designed to be easily removable, even whilst riding for a speedy transition. Most triathlon shoes use a single wide Velcro strap to secure your foot. This makes it easy to adjust and undo the strap whilst you are on the bike. Triathlon shoes also tend to be heavily ventilated, to allow the foot to dry after a swim. I strongly recommend that you visit a retail shop to buy women’s clip-in cycling shoes because you can try them on and receive advice from the retailer. You might have to visit a few shops to find the right shoes for you but it is worth it if you’re going to spend hundreds of dollars on a pair of shoes, and wear them for hours on the bike. I would never wear anything but clip in shoes for either my mountain bike or road bike. I’m willing to bet even the most experienced of us have fallen over more than once not getting unclipped in time. But the only damage was to my ego and the side of my pedal! Go for it!